* Re-issue of a publication initially released to acclaim in 1990 by Patrick Stephens Limuted. * Features extensive photographic illustration throughout. 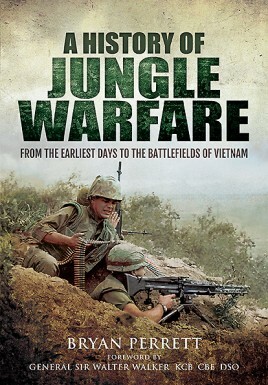 * An engaging history of the intricacies of jungle warfare in a variety of contexts through the ages. A world where little light penetrates. Of dense vegetation, tangled roots, fetid mud and swamps. Where the helicopter, sophisticated weaponry and technology have revolutionized military combat. But where survival still depends on acute observation and listening for the slightest sound. The jungle. Backdrop to one of the most grueling of all forms of warfare. To wars that in recent times have changed the course of history. The subject of this expert, extensively illustrated study by Bryan Perrett. Originally published to acclaim in 1990 by Patrick Stephens Limited, this re-issue represents a determination on the publisher's part to keep this esteemed volume in print.